We have recently moved office, and now the nearest lunch time eatery is a branch of Subway just across the road. I sense this is not going to be good for my waist line (I love their cookies), but obviously I was keen to check out the full menu as it has been a while since my last visit. On the “New” sign were two new subs, both with chorizo as the new ingredient. There was a Chicken and Chorizo sub and a Steak and Chorizo melt, which is what I opted for. I had it toasted to ensure the cheese was melted nicely, and I chose the Italian style bread. For additions I had tomato, lettuce, cucumber, olives and light mayo. 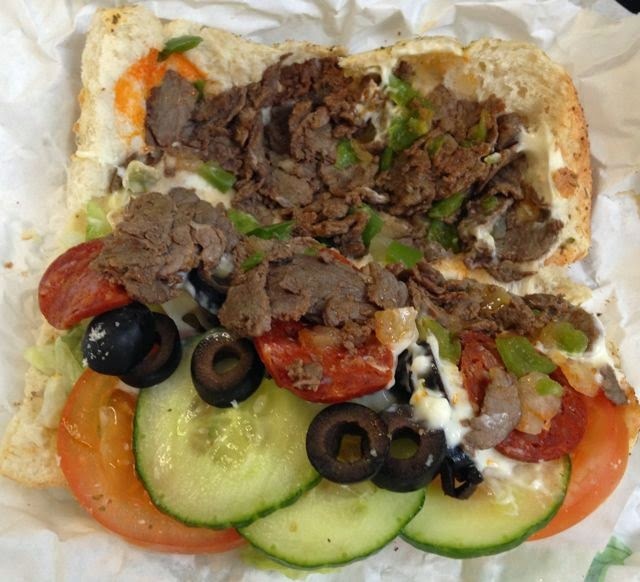 I do love how you can build your sandwich how you like it at Sub, which means it is always perfect. They seem to deal with the queue quite quickly too despite this. I thought the Sub was lovely, the flavours I’d chosen were all quite European, and worked well together. The chorizo was just lovely, it had a surprisingly good heat to the meaty flavour, and gave my lunch a good warm spicy glow. With the steak and cheese on top the chorizo made the Sub taste like a spicy meat feast. They will add the chorizo as an extra on any Sub, so I think some experimenting is in order next time I go. Now did I mention I love Subway cookies? They are lovely American style soft in the middle ones. Obviously I picked the “New” flavour, I am predictable after all, but I’m pretty sure I’ve seen the flavour Raspberry Cheesecake before? I thought it tasted rather like raspberry and white chocolate. It was rather nice though, sweet, with plenty of berry bits which were fresh and zesty. The white chocolate bits were creamy, and it was a nice treat after my sub. 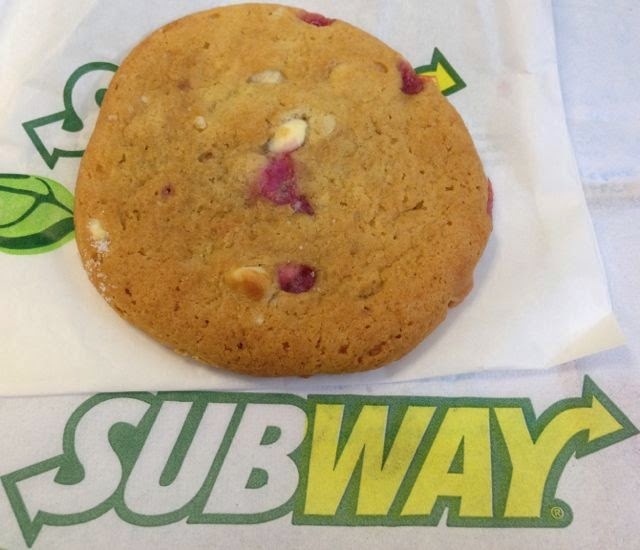 I can never resist a cookie in Subway!